York Event Caterers specialising in Hog Roasts & Barbecues. As one of York’s best outside catering companies, our York Caterers are ideally located close to the region’s motorways, so we can travel easily with our catering vehicles into York or across Yorkshire. We cater for numerous events in York but also cover the Leeds area, North as far as Darlington and even Sheffield and further south as far as Chesterfield – we also cover catering events in the Hull area too! Our York catering business was formed in 2006 and we’ve expanded quickly to become one of Yorkshire’s best York event caterers and outdoor caterers while also offering indoor catering services. Our professional York caterers execute efficient and relaxed large-scale barbecue catering events and parties. We only use fresh local ingredients and free range meat for our menus. We are famous for our Hog Roast catering and hire service, with an amazing hog roast supplier and mouth-watering free range hog roasts which are a special cross breed. These stunning hogs are thought to be some of the top 1%-2% of the elite free range pork in the United Kingdom, they are the best Hog Roasts in Yorkshire and have won the Good Pig prestigious award for 2012. Our hog roasts also won Supreme Champion award at the Deliciously Yorkshire show, you’ll only need to have one taste to recognise the difference in quality these hog roasts hold. 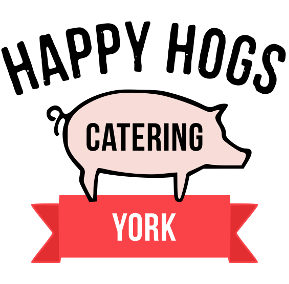 York Caterers Happy Hogs & BBQ may already have top quality barbecues, wedding catering and hog roasts but we never get complacent or rest on our laurels. We always strive to create new ideas and exciting fresh menus which motivate us to also bring the best of international cuisine to our clients and the events we cater. Traditional big pan Spanish Paella and authentic big pan Gastro fayre bring new flavours and exciting alternative menus to your party guests. Big pan cuisine is cooked right before your eyes by our York event caterers, your guests can watch the freshly prepared food being cooked and have it served straight from the pan to their plates. A wonderful and exciting experience! No matter how tasty our slow-cooked food is, we realise that the best menus are those chosen and tailored to our clients. Our York event caterers provide a variety of options and menu choices which you can tailor to your exact requirements to make your catering package absolutely perfect. Please feel free to contact us for a quote or to discuss ideas for your catering event. We take our York event catering services very seriously indeed, providing the best York event caterers and serving team possible. Our York catering team setup everything needed and clean away all the pots and dishes afterwards. We can cater to all types of parties, events and businesses throughout York and Yorkshire. York event catering can include birthdays, street parties, weddings and other types of gatherings and fairs. We are also one of Yorkshire’s best corporate catering teams, no event is too big or too small!